Without further investment and protection, the Jerome Avenue rezoning proposal has the potential to irreparably affect the character of the neighborhood. Entrance to the 176th Street Station in the Bronx. Photo: Wikimedia Commons, Jim Henderson. While we appreciate the City’s community outreach efforts under the Jerome Avenue Neighborhood Plan, we find a disconnect between those goals and the strategies identified to achieve them through the rezoning proposal. We remain particularly concerned about housing affordability, residential and commercial displacement (especially automotive-related businesses and workers), and the impacts that such an influx of new residents and workers would have on neighborhood schools, daycare facilities, and open space. The New York City Department of City Planning’s (DCP) rezoning proposal, which includes zoning map amendments, zoning text amendments, and city map changes, would affect an approximately 92-block area primarily along Jerome Avenue and the adjoining eastern and western commercial corridors in Bronx Community Districts 4, 5, and 7. The rezoning is expected to add 3,228 dwelling units (DUs), 72,273 square feet (sf) of community facility space, and 20,866 sf of commercial/retail space to the project area, while decreasing the amount of industrial and automobile-related space by 47,795 sf and 98,002 sf, respectively. Moreover, it is anticipated that under the proposal, nearly 9,500 new residents will move into the neighborhood. With almost 36 percent of households at or below poverty level, this neighborhood is one of the city’s lowest income communities. Thus, one of the most pressing concerns for local residents is the availability of affordable housing. The City asserts that indirect residential displacement resulting from the rezoning would be mitigated by the implementation of the Mandatory Inclusionary Housing (MIH) program. However, the City has yet to disclose the total number of expected affordable units, the income requirement breakdowns, or evaluated alternative scenarios given the different MIH affordable housing options available. As a result, MAS finds the DEIS to be deficient in the assessment of indirect residential displacement and stresses that the Final Environmental Impact Statement (FEIS) must identify the number of expected affordable units, evaluate multiple MIH options, and disclose the projected source of financing for each affordable development in order for the analysis to be complete. Without a detailed housing plan, MAS questions the validity of any determination that concludes displacement impacts will be mitigated effectively. Median Household Income and Mandatory Inclusionary Housing – The median household income in the Jerome Avenue neighborhood is $26,226. Twenty percent of area households earn less than $10,000 annually. Therefore, apartments would need to rent for $650 or less in order to be considered affordable for the 50 percent of residents making less than the median income. The “deep affordability” option under MIH requires 20 percent of units be affordable to households making an average of 40 percent of Area Median Income (AMI), which is $34,360 for a household of three. Therefore, even at this level of affordability, housing would be considerably out of reach for the majority of area residents. While the current Department of Housing Preservation & Development (HPD) term sheets address some of this need for deeper affordability in the immediate future, we are concerned about long-term affordability in the absence of these subsidies. As is the case with rezonings in other low-income communities across the city, the current MIH affordability options fail to adequately serve the residents in the Jerome Avenue project area. MAS recommends that the rezoning text mandate at least 20 percent of the affordable units should be at or below 30 percent of AMI in order to address this gap and more accurately reflect neighborhood median incomes. Rent-Stabilized and Rent-Regulated Units – It is clear that rent-stabilized and rent-regulated units contribute greatly to housing affordability for area residents. According to the HPD, two-thirds of all households in the Jerome Avenue area are rent-regulated. Forty-one percent are rent-stabilized and 21 percent receive some type of government assistance. In the rezoning project area, there are 78 multifamily residential buildings registered with the New York State Department of Housing and Community Renewal (DHCR) containing 4,250 units that may be rent-regulated. Within a quarter-mile, there are more than 700 multifamily buildings registered with DHCR containing approximately 37,000 units. We find the preservation of these units to be critical for the stability of lower-income households in the area. In addition, tenant harassment by property owners is a major concern in the neighborhood. MAS supports the proposed inclusion of the Jerome Avenue rezoning area as a neighborhood in which property owners would be required to obtain a certification of no harassment before receiving permission to redevelop. This will help strengthen the preservation of affordable units and prevent harassment of tenants by those seeking to redevelop their properties in order to garner higher rents. While MAS applauds the City’s preservation efforts in the Jerome Avenue corridor to date, we strongly encourage continued and ongoing investment in preservation as a necessary insurance against residential displacement and the protection of long-term affordability. According to the DEIS, approximately 77 firms employing 584 employees would be potentially displaced under the rezoning. Despite this, the DEIS concludes that the rezoning would not have adverse impacts on local businesses. The DEIS also concludes that any potential for commercial displacement would be offset by the introduction of a substantial new residential and worker population that would in fact sustain the customer base of existing businesses. MAS finds these conclusions to be unfounded at best. With the addition of 1,765 market-rate DUs under the rezoning, it is expected that a customer base with substantially higher incomes and retail preferences than current residents would be introduced to the area. Furthermore, at the deepest affordability scenario under MIH, only 20 percent of eligible households would be earning $31,080–nearly $6,000 more than the current area median. Therefore, the mere introduction of a moderate amount of affordable DUs at higher AMI bands could bring a dramatic shift in area socioeconomic conditions toward a higher income bracket with different retail preferences, not to mention the market-rate tenants. As a result, the rezoning may have a harmful effect on many neighborhood businesses that cater to the existing population. There is no doubt that a disproportionate number of the businesses facing potential displacement are in automotive-related industry sectors. Meanwhile, the DEIS asserts that there would not be a significant impact on any specific industries even though 160 workers, or 28 percent of all potentially displaced workers, are employed in automotive related industries. According to Under the Hood, a report prepared by The Pratt Center for Community Development, these businesses occupy sites with the lowest value per square foot ($50) in the rezoning area, making them prime for redevelopment. The displacement of these businesses and jobs presents a substantial impact to the automotive industry, which is composed of an interdependent ecosystem of firms including automotive repair, wholesale parts sellers, and other related businesses. The DEIS states that displaced auto-related businesses could relocate to other clusters throughout the city. However, relocation for these types of business is difficult, as they require the availability of C8 commercial and manufacturing zoning, which has been reduced because of other recent city rezonings (e.g., the Atlantic Avenue corridor in Brooklyn and Willets Point, Queens). In addition, previous plans for the relocation of automotive businesses and workers in Willets Point, Queens have largely been unsuccessful. MAS believes the preservation of existing automotive-related businesses and jobs is of paramount importance. We urge the City to continue exploring the expansion of C8 preservation zones, and examine other solutions such as Councilmember Vanessa Gibson’s Commercial and Auto Repair Stability Act (CARS) legislation that would provide resources and protections for automotive businesses. Public Schools – The introduction of 9,500 new residents will substantially increase the demand on area community facilities. One of the primary concerns is overcrowded elementary and intermediate public schools. While all public schools within the rezoning area are expected to see an increase in utilization rates, several of the already over-capacity schools in Community School Districts 9 and 10 will see utilization rates rise dramatically. For example, the intermediate schools in District 9, sub-district 2 will reach over 170 percent of their capacity with the rezoning! In total, the rezoning is expected to result in a deficit of several thousand public school seats. This is unacceptable and must be addressed with appropriate mitigating actions. Unfortunately, we find the mitigation measures identified in the DEIS to be vague recommendations regarding reorganizing existing public school space and the creation of additional space through new construction, options which lack a firm commitment to action. While DCP plans to explore potential mitigation measures on a timeline between present day and the publication of the FEIS, this does not allow sufficient time for meaningful public engagement of families living in the proposed rezoning area. Therefore, we request that the City provide this information as part of the environmental review process. Child Care Services – The rezoning would result in a deficit of 92 spots in publicly funded childcare facilities in the area. Unfortunately, the DEIS does not identify this as an adverse impact warranting mitigation because it does not exceed CEQR thresholds requiring further analysis. MAS finds that in the Jerome Avenue community, any deficit in childcare facilities to be an adverse impact that requires mitigation. Therefore, we urge DCP to identify and commit to additional mitigation measures for the anticipated impacts on childcare services in the area including, but not limited to, adding more daycare facilities under the rezoning proposal. The Jerome Avenue community is greatly underserved by open space. With the 9,500 residents and 975 workers expected under the rezoning, demand on the limited open space will only worsen. In fact, according to the DEIS, areas would achieve a paltry 21 percent of the City’s goal of 2.5 acres of open space per 1,000 residents, a 6 percent decrease over current conditions. However, the DEIS concludes that no significant adverse impacts on open space would occur simply because the conditions do not exceed CEQR thresholds requiring additional analysis or mitigation. MAS asserts that the City must pursue ways to improve existing and create new open space to accommodate the demands of the existing and future population of the project area. Development facilitated by the rezoning is expected to result in significant shadow impacts on eight open space resources–the Bronx School of Young Leaders, the PS 306 Schoolyard, the Mount Hope Playground, the Goble Playground, Inwood Park, and Keltch Park. The DEIS shadow analysis also identifies two additional smaller sites that would incur a complete loss of sunlight during growing season (the Edward L. Grant Greenstreet and the Jerome Avenue/Grant Avenue Greenstreet). Despite these impacts and with the current lack of open space in mind, no clear mitigation measures have been proposed. Therefore, MAS urges the City to examine design changes affecting future development that eliminate or greatly reduce shadow impacts on these valuable resources and commit to the creation of new open space in the area. The proposed rezoning area contains several cultural and historic resources that could be affected by development associated with the rezoning. According to the DEIS, the rezoning has the potential to result in construction impacts on the State/National Register of Historic Places (S/NR)-listed Croton Aqueduct System and associated park. In addition, several projected and potential development sites are within 90 feet of the S/NR-eligible U.S. Post Office–Morris Heights Station. Therefore, we request that all correspondence between the City, the State Historic Preservation Office (SHPO), the Landmarks Preservation Commission (LPC) must be made publicly available on the City’s website and, to the extent practical, included in the FEIS. Significant adverse traffic impacts are expected at 22 intersections in the rezoning area. Therefore, MAS requests that all mitigating traffic engineering improvements recommended by the Department of Transportation (DOT) be included in the FEIS, with a detailed explanation of their design, implementation, and anticipated impacts. Further, MAS requests disclosure of the DOT approval process for these mitigation strategies as well as explanation of how mitigating actions are tested and evaluated for efficacy. At present, none of the elevated subway stations on the 4 line in the study area are compliant with the Americans with Disabilities Act (ADA). 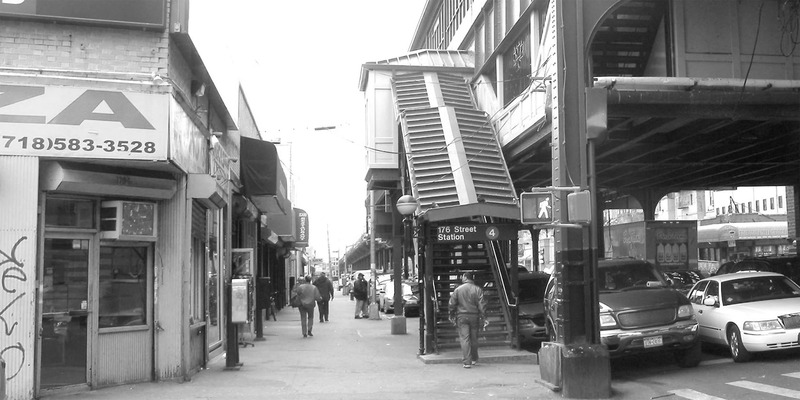 As infrastructure and streetscape improvements are made in the area, the creation of ADA accessible entrances and exits at these stations should be considered a top priority. The Jerome Avenue rezoning proposal comes at a critical time for the community and the city as a whole. With almost 10,000 new residents coming to the area, protections must be in place to ensure that current residents and businesses are not pushed out. While MAS supports the efforts the City has made to engage community members in the creation of the Jerome Avenue Neighborhood Plan, the rezoning does not adequately resolve critical issues the community will face with regard to residential and commercial displacement, access to and availability of affordable housing, overburdened schools and daycare centers, and the lack of open space. MAS strongly urges the City to incorporate our recommendations into the rezoning proposal and work towards a plan that accommodates new people and business without forever altering the character of the Jerome Avenue community. Abello, Oscar. Help for NYC Auto Repair Shops Could Save Thousands of Jobs. March 21, 2017. 2014 LEHD Origin-Destination Employment Data.